Tokyo. The Tokyo Dome nearly witnessed another upset on the first day of the second round on Friday. 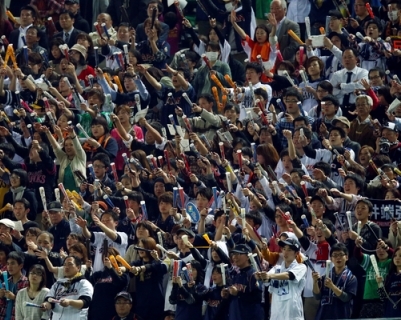 In the evening game to kick off the double elimination phase at the 2013 World Baseball Classic, Japan scored in the top of the tenth inning to prevail 4-3 against a strong team from Chinese Taipei. Japan now will square off with the Netherlands on Sunday, while Chinese Taipei tries to avoid elimination on Saturday against Cuba. Chinese Taipei had a much better start into the game on Friday than Japan. Pitching by Chien-Ming Wang, Wei-Lun Pan and Hung-Chih Kuo kept Team Samurai off the board through the first seven innings. Additionally a bases loaded walk by Szu-Chi Chou in the third and a RBI single by Cheng-Min Peng in the fifth had given Chinese Taipei a 2-0 lead. But Japan struck back, when Hung-Chih Kuo came back on the mound for the eighth. Against him and Ching-Ming Wang Japan was able to even the score thanks to RBI singles by Shinnosuke Abe and Hayato Sakamoto. Chinese Taipei reacted unimpressed, answering with a RBI single by Szu-Chi Chou in the bottom half of the eighth, regaining the lead. Once again Japan was able to strike back. With two outs and a runner on second, Hirokazu Ibata came through and tied the game with a RBI single with a line drive to center field. Chinese Taipei couldn’t score in the bottom of the ninth and the game went into extra innings. Japan didn’t waste any time and led off the tenth with a single and a walk. A sacrifice bunt by Hayato Sakamoto moved both runners into scoring position. Sho Nakata followed with a sac fly to left field, plating Nobuhiro Matsuda to put Japan in front 4-3. In the bottom of the tenth Chinese Taipei threatened to come back, as Chih-Kang Kao and Chien-Ming Chang reached with back-to-back one-out singles. However Yung-Chi Chen grounded into a game-ending, rally-killing double play to seal the deal for Japan. Kazuhisa Makita (W, 1-0) received the win in relief. Hung-Wen Chen (L, 0-1) was charged with the loss. With the win, Japan has earned another off day on Saturday before facing the Netherlands on Sunday. Chinese Taipei will take on Cuba on Saturday, trying to avoid elimination from the 2013 World Baseball Classic.